… I have been using a single slide to orient executive teams, project teams, stakeholders, etc. 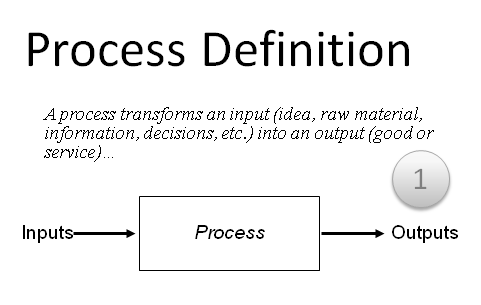 on What is a process? In simple terms all the work, tasks, activity, etc. we accomplish at work, at home, at school, on-line- anywhere- can be thought of as process. the local office archives (long before the electronic library) and stumbled upon some operational analysis and reports from the 1960′s. These engagement artifacts analyzed various elements of plant performance and operations. All of the analysis was founded in operational processes. Snap forward to Mr. Hammer & Mr. Champy’ s effort of 1993, reengineering is a packaged approach to process redesign by eliminating no-longer-relevant historical constraints and adding technology enablement. Reengineering gave everyone license to include the work of knowledge workers’ (previously known as white collar workers) work as processes. Unfortunately, the term reengineering continued on to pick up a connotation of “downsizing” or “retrenchment”, depending on which side of the Atlantic you find yourself, as latent staff inefficiencies were eliminated from many key business processes. Business process thinking was re-packaged again for the massive Y2K investments, where some Enterprise Resource Planning software companies implemented “best practice” processes with all of their top clients. Today, processes are widely recognized as the way we do business, even if they are seldom applied beyond the manufacturing plant and the occasional new product development process. Most recently, a series of process-centric methodologies have ebbed and flowed in favor, including six sigma (à la GE/Jack Welch) and Lean (based on Toyota’s success with lean manufacturing- and currently being extended into just about all fields). Processes are used for everything from statistical process control of a manufacturing line to integrating mergers to strategic planning (around capabilities). Informal and formal processes are the backbone of business. As processes are the way we (I am paraphrasing from a number of sources) plan, execute, measure and refine our work. Economically achieving process-customer satisfaction is the No. 1 objective of each process, or should be. After defining who the process-customer is (internally or externally), the next step is to understand their requirements. One way to think about customer needs aligned to process output is to walk through three scenarios for requirements-based delivery of goods and services. While Goldie Locks comes to mind when considering these process-customer scenarios, having stable processes can be an enabler to drive root cause analysis. And, more importantly, to fixing any problems or mis-alignment with customer needs. This is too high level to be particularly useful given what we know of processes today, but illustratively everything we do (every process) for an organization can map into one of those three enterprise-level mega-processes. How it maps and how many levels of process definition, documentation, integration, etc. depends on what you are trying to achieve with your process work. While it is not absolutely necessary to start at the top of the organization and drive down (e.g., enterprise processes, progress groups, processes, steps, tasks, etc. 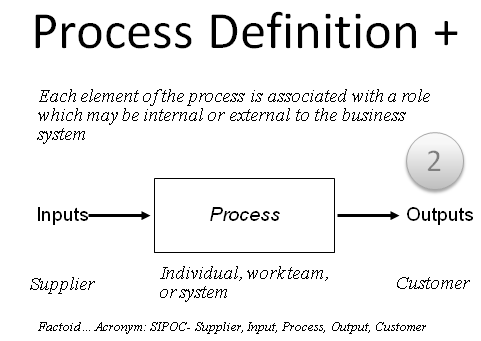 ), it can be helpful to everyone if there is at least a high-level framework to give context for process integration (e.g., defining process suppliers and process customers).